Cyclo Industries, a leading global automotive car care brand for over 50 years, received the prestigious New Product Showcase Award, for appearance chemicals and car care, at AAPEX* (Automotive Aftermarket Products Expo) for their product, Clear View™. Clear View™ is an at home solution to repair and to prevent damage caused by environmental elements to glass windscreens. 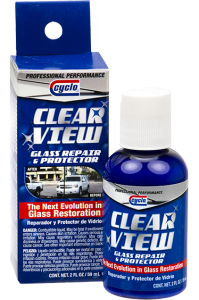 Clear View’s innovative formula reverses damage caused by acid rain, salt, sand, and hard water, eliminating the need for costly windscreen replacements and repairs. With the launch of Clear View, the consumer now has a more affordable and accessible option to fix a damaged windscreen. “We are honored to receive the 2015 New Product Award. Innovation is very important at Cyclo, and Clear View is just the surface of our innovative products,” said Cyclo Vice President Doug Salazar.